Professional competitive eater Molly Schuyler wolfed down 27 burgers in 10 minutes outside Z-Burger in D.C. on Tuesday. She retained her title as champion of the annual competition. News4 takes a look. One of the world’s leading competitive eaters scarfed down 27 burgers in 10 minutes in D.C. on Tuesday to win Z-Burger’s 9th annual Independence Burger Eating Championship. Molly Schuyler successfully defended her four-time title as the Z-Burger Champion, winning a $1,500 cash prize. 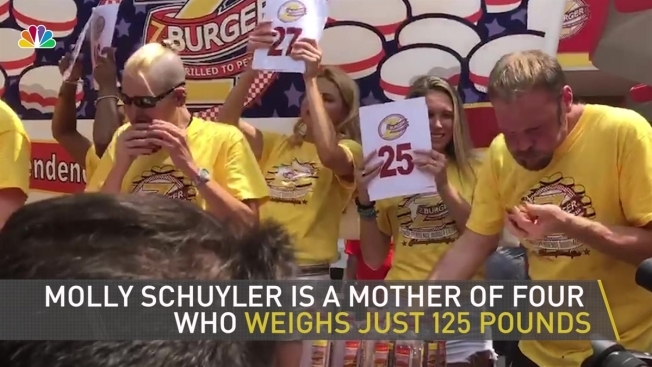 The mother of four and professional competitive eater stands 5-foot-7 and weighs just 125 pounds despite eating all those burgers. Before she competed at Z-Burger's location near the Tenleytown Metro station, she said she had only one goal. “I just don’t want to come in last. I’ll be happy with that,” she said. Schuyler, of Plumas Lake, California, recently ate 501 wings in 30 minutes, and six large containers of cottage cheese in under 90 seconds. At Z-Burger, she was expected to win again on Tuesday. Ten contestants competed for a total of $4,000 in cash and prizes. The competitors ranged from seasoned veterans of eating competitions to first-timers. The rules of the game changed this year: Competitors could not stack or soak the food, and they needed to finish one burger before starting the next. Eaters could not vomit during the competition or two minutes afterward, or they would face automatic disqualification. Two-time competitor Dan Kennedy took second place, breaking his goal of 20 to scarf down 24 burgers and claim an $850 prize. He credited his success to strict training. “Keep training, keep practicing — just working on technique," Kennedy said. "It’s like any sport; you just have to do it to get good at it." David Brunelli tied for third, eating 18 burgers in 10 minutes. Food and water poured out of his mouth twice during the contest — once onto this reporter — but the judges ruled that he did not vomit, and allowed him to stay in the competition. Once Schuyler was named the winner, spectators were offered free Z-Burgers — if they could stomach them. The winner said she wanted to drink a milkshake and take a nap. When asked how she eats so much and stays slim, her answer was simple. “I have four kids!” she said.